Dr. Lowe attended Life Chiropractic College West in Hayward California and was impressed with the education she received. After completing the 4 year curriculum that included anatomy and physiology, biochemistry, radiology, diagnosis, and patient care protocol she realized that her education taught her something else as well. “I walked away from school with a profound understanding of how amazing the human body really is! The nervous system controls and regulates every cell in the body and as a Chiropractor, I am going to be able to help make sure this system works so that people have a higher level of function. 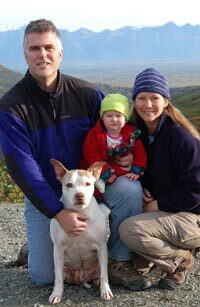 Wow!” She couldn’t wait to get back to Alaska and share her knowledge and aspirations with the families of the Valley and her office has been serving families since 2004. “Our office is very inviting and friendly. We have a lot of families here so there is a big playroom and a library of books that offer information on health and wellness issues. Sharing healthy habits with our children is a way for families to interact with each other but also helps them grow to be healthier and happier people!” (Ask us for more information about Chiropractic care for pregnant moms and children). She recently married Daryl, a fellow Rotarian, and together they are very active in their community. She has a one year old stepdaughter who keeps them on their toes! They are avid Iditarod followers and also enjoy camping, biking, lots of fishing, and watching hockey.